Jeni's Splendid Ice Creams will be opening a shop at 3404 N. Southport Ave.
LAKEVIEW — Jeni's Splendid Ice Cream's new shop on Southport will be scooping gourmet flavors starting next week. The Columbus, Ohio-based company will host a public party at the 3404 N. Southport Ave. location from 7-10 p.m. Sept. 13 with free ice cream. The first 50 people to show up will also go home with a commemorative poster. Jeni's founder Jeni Britton Bauer will also be present for the party. "Our ice creams are truly Midwestern and reflect not only what grows in this region, but also the culture here," Britton Bauer said in a statement. The shop will officially open for business the next day, Sept. 14, with hours from 11 a.m. to 11 p.m. The Southport shop is the company's first in Chicago. Since Jeni's announced it'd be joining the street, employees have been selling their artisanal treat at local farmer's markets and summer festivals. The ice cream is also being featured in milkshakes at Logan Square's Intelligentsia Coffee Bar. Jeni's opened in 2002 and has since opened 13 shops in Ohio and Tennessee. 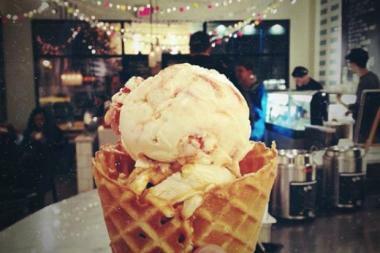 Upscale markets such as Whole Foods, Southport Grocery & Cafe and Fox & Obel sell $12 pints of Jeni's flavors. Britton Bauer also wrote an ice cream cookbook, "Jeni's Splendid Ice Creams at Home," which won the James Beard Award for best baking and dessert book in 2011.